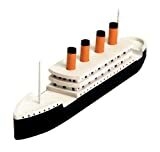 This wooden model Titanic kit is great for school camp, scout activities and at home. This kit contain precut Wooden easy to follow instructions for assembly and finishing all you need is the glue, sandpaper and paint . There is a variety of choking hazard-small parts and not for children under 3 years. This product weighs 0.17-pounds. 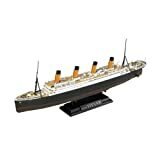 Measures 1-inch length by 3-8/9-inch width by 10-1/2-inch height.